A rescue swimmer lowers 250 feet to a stranded hiker. 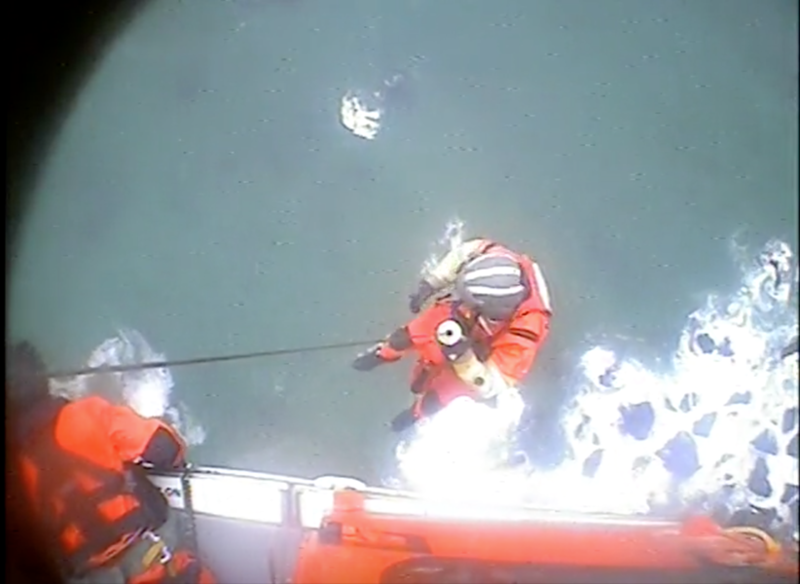 A crew from U.S. Coast Guard Sector Humboldt Bay rescued a stranded hiker near the mouth of the Klamath River on Sunday. The hiker had contacted the Del Norte County Sheriff’s Office at about 2:30 p.m. to report he’d become stranded at the bottom of a 300-foot cliff near the mouth of the Klamath River while hiking the Damnation Creek Trail. The sheriff’s office then contacted U.S. Coast Guard Sector Humboldt Bay, which dispatched a MH-65 Dolphin helicopter to the scene. The helicopter arrived at about 3:30 p.m., found the hiker waving a red flag on some rocks near the breaking surf and hoisted him to safety. MCKINLEYVILLE, Calif. — The Coast Guard rescued a stranded hiker three and a half miles north of the Klamath River mouth, Sunday. The stranded hiker contacted Del Norte County Sheriff's Office dispatchers around 2:30 p.m., reporting that he became stranded at the bottom of a 300-foot cliff near the Klamath River mouth while hiking the Damnation Creek Trail. The Del Norte County Sheriff's Office contacted Coast Guard Sector Humboldt Bay watchstanders requesting assistance with a rescue helicopter hoist. Sector Humboldt Bay watchstanders maintained contact with the stranded hiker via cell phone and dispatched a Sector Humboldt Bay MH-65 Dolphin helicopter crew to the scene. The helicopter crew arrived on scene around 3:30 p.m. and located the hiker, who was on the rocks near the breaking surf waving a red flag. "A layer of dense fog was rapidly moving into the area, requiring quick action by the helicopter crew," said Lt. Audra Forteza, the Sector Humboldt Bay public affairs officer. "The dynamic situation required the crew to hover 250 feet above the stranded hiker to keep clear of the cliff face. A rescue swimmer was lowered to the hiker, using all available hoist cable." Once the rescue swimmer was safely on the ground, the helicopter hoist system experienced a malfunction. The helicopter crew quickly diagnosed the issue and was able to use emergency power to recover the stranded hiker and the rescue swimmer to the helicopter. The hiker was flown to Sector Humboldt Bay where he was met by family members. The hiker did not report any injuries.